Properties in Faro District average 4.6 out of 5 stars. CASA PINHEIRO II; Fantastic view of the ocean and the village. 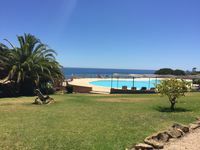 Property 9: CASA PINHEIRO II; Fantastic view of the ocean and the village. SUPERB APARTMENT WITH FREE WI-FI, BALCONY, SHARED POOL AND SHORT WALK TO BEACH. Property 18: SUPERB APARTMENT WITH FREE WI-FI, BALCONY, SHARED POOL AND SHORT WALK TO BEACH. A stylish and spacious apartment in the beautiful Algarvian town of Tavira. Property 28: A stylish and spacious apartment in the beautiful Algarvian town of Tavira. Fabulous townhouse with full A/C, private pool and close to Burgau Beach. Property 37: Fabulous townhouse with full A/C, private pool and close to Burgau Beach. Good size property and well equipped, in a quiet, peaceful and relaxing location ideal for getting away from it all. Very comfortable, well equipped, ideal location.